You've never been to a place quite like Gilman Village. House mover guides the Louis Monti house (#20) down Front Street to its new home in Gilman Village. 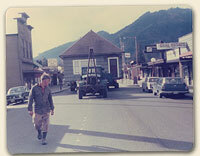 It all began in 1972 when Marvin and Ruth Mohl started saving unwanted buildings from around the old farming and mining town of Issaquah, just east of Seattle. They renovated and combined them into an attractive retail area in a park-like setting. Their goal was to create a haven for independent shops and restaurants. A quarter century later, the 40-plus shops and restaurants that make up Gilman Village constitute one of Puget Sound's best known and most distinctive shopping destinations. In saving the buildings, the idea was to honor the character and ambiance of the old community rather than to create a museum. 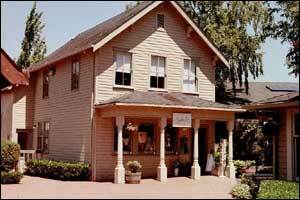 Still, the buildings that house the shops and restaurants of Gilman Village represent a significant portion of Issaquah's history. Once brought onto its permanent Village site, each building was almost completely disassembled and rebuilt virtually from scratch. The Issaquah Design Commission recognized the combined efforts of the Mohls and a design team that included The Baylis Architects, and landscape architects Richard Haag Associates and Stephen G. Ray in 1977 for quality of design and landscaping. The irony of the award was that when it all began, there was considerable controversy about whether the old buildings would be an eyesore in the midst of the town's march towards modernity. In 1985, the Bellevue, Washington, Chamber of Commerce presented the Eastside Quality of Life Award to Gilman Village for "the pleasures it gives through its rich discoveries of spaces and forms."